So here we are again on Bradley's huge lake within the watermark complex. This time we had heard stories that the bank on the opposite side of "the point" was producing some big carp over the previous few weeks, this was the bank with the new swims where access is via gate 2 from the industrial estate. We decided to look at the swims first before making a decision as we wanted to check out all our options. Luckily, we seen a few rolling fish in peg 3 and immediately started to think about giving it a try. The wind was pumping south-west again and had been for a few days. This means we was on the back end of the wind, however, we was fishing in the wind a few weeks before and still struggled to catch carp from the main lake. 6pm: With the rods all set and in the water, I decided not to bait heavily this time. Instead I was going to fish for a bite at a time, with the intention of baiting heavier if there was plenty of action. I was using the dynamite PVA stick tactic on 2 of the rods, with the third rod on the method and corn on the hook. I felt that smaller baits at Bradley's tend to pull more bites, so I would use pellets and corn and leave the boilies a rest for a few days. Over the following 4 hours there were no takes. 10pm: The middle rod made me jump when it screamed off for a long run. That'll teach me to mess with the bobbins while the rig was out! After 5 minutes of fight a stockie mirror carp was pulled into the landing net. As soon as the fish was back into the water, my left rod went off - another stockie, both carp were less than 6 pounds in weight! 11pm: After setting the rods for the night, I got my head down with no takes during the night. I have found that the carp at Bradley's don't often feed at night. However, in many lakes anglers can struggle to get takes in the afternoon, at Bradley's a run in the afternoon is common from my experience. I prefer this, after all, the photos are much better! 7am: Not much happening during the morning. I attempted to find some new features with the marker rod for over the next few days. I found a little clear gap between 2 long weed beds. I figured trying to place a bait in the weed but just on the edges. This was so the main line is not laying across the hard, clear areas where the fish may see it, especially as Bradley's has very clear water so i think the fish can see anything that isn't camouflaged well. 12pm: After a few hours of no action I finally had the bobbin on the middle rod start to climb slowly. I struck into the fish immediately not giving the fish time to drop the hook bait. Yes, I had pulled into a fish. 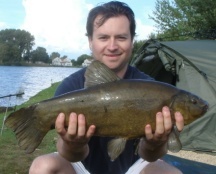 Within 5 minutes I was pulling in a big tench (picture above). Not bad though, over 7 pounds on the scales! 3pm: Another take, but another tench. Not what I came here for, but at least I know the rigs are working fine. I decided to try bigger baits by using 18mm boilies. I do like tench but I was hunting for a carp. 8pm: The bigger boilies didn't seem to work, so now I wanted to put back the smaller hook baits. Thinking the carp might see the tench feeding and encourage them to move in. No such luck for the rest of the day. 1am: With not much action at all during this session, I decided to put all rigs in PVA bags, but using different baits and placing all the rigs in the weed. The had read about how Danny Fairbrass does this and believes that the bigger carp will often feed confidently in the weed as they associate it as safe. The first rod had chopped boilies in a large PVA bag. the second rod I used pellet of various sizes, and for the third rod i used sweetcorn so the mass of bright yellow might help stand out more than anything else. It's possible to place wet sweetcorn into PVA bags if you first cover all the kernels in caster sugar. this helps to seal in the moisture and stops the water getting to the PVA. Although this is not easy to do I persevered until it was right. With my confidence high about my new carp fishing tactics, I sat down and waited for that beautiful sound of a screaming run - No more takes all during the night! BLOODY marvellous!! What are the Best Baits for Catching Big Carp? How Does Raining Affect Carp Feeding Patterns? Can We catch Big Carp On Cheap Bait? What is Best Length for Hook Links on Carp Rigs? How Often Should We Use Pop-Ups on Fishing Rigs? What Fishing Situation Best to Use Pop up Hook Baits? Do We Always Need to Use Best Quality Carp Fishing Bait? What Rig Systems for Which Fishing Situation? How much Gap from Hook Bait to the Hook Bend?